I've been busy, so busy. Holidays, work, kids, reading, crochet have kept me out of trouble but no time to blog. Winter is here in full swing, and with that comes a little bit of a loss of enthusiasm unfortunately. I've been busy making loads of hats and jewellery, tons of orders have kept me busy!! But there has been a bit of time for a lovely Rainbow Scarf for each of my girls, a few natural remedies (hence the Calendula below) and of course baking. It's been a busy morning, racing the kids around to school, swimming, creche and now I'm having a peaceful cup of tea before I need to hang out yet another load of washing - it's the first non-rainy day in quite a few days. I love Mondays! It's my "day off". No kids, no work (well, not in the office anyway) and I can turn up the radio and enjoy the relative peace. Love the scarves! 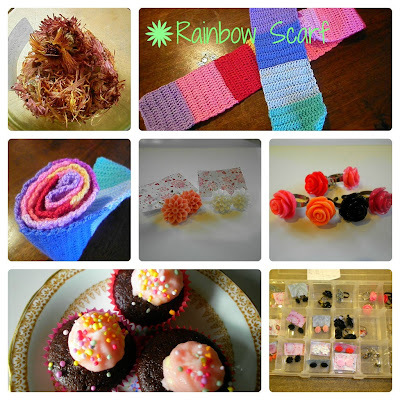 You've got me wanting to make rainbow stripes now too! Lovely to see you post again. I know life can get in the way sometimes ay. Blimmin' freezing here today - can't feel my toes and that's inside the house - eeek! I love rainbow stripes, so that scarf is a real winner!! Yummy cakes and gorgeous jewellery, too.